The Price List extension show a new page that displays all products of your store,that Allow users to see all products prices at one page with multiple product Info. its multiple Filter option helps to find products what you are looking. it Provides convenient way to access all store products in a highlight configurable filters. In Simple Wording, to find all products from All Store is the most complicated part of online store, most of shoppers leave online shopping due to complicated steps.But price list extension greatly simplifies this process, with improving the user experience. this extension not only increase your immediate sales but also longer term return visits. because this extension Show All Store products on One page. 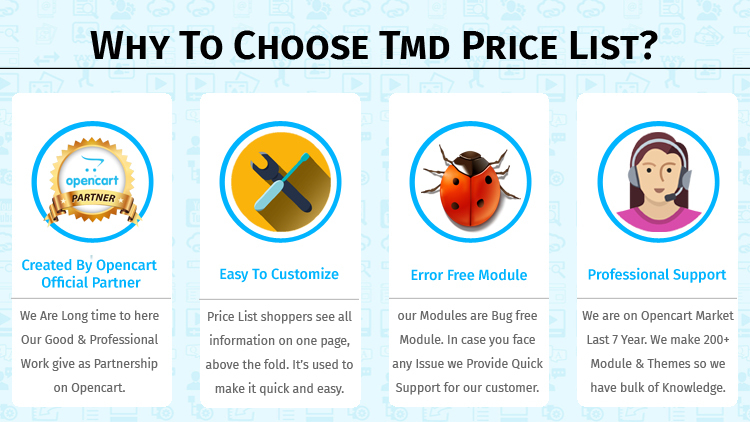 - Price List extension allow you to customize price list with different featured like layout setting, Show/Hide product data columns, background colors of panel, font color. If Product Price is zero(0) add text like (any custom link, custom Image). 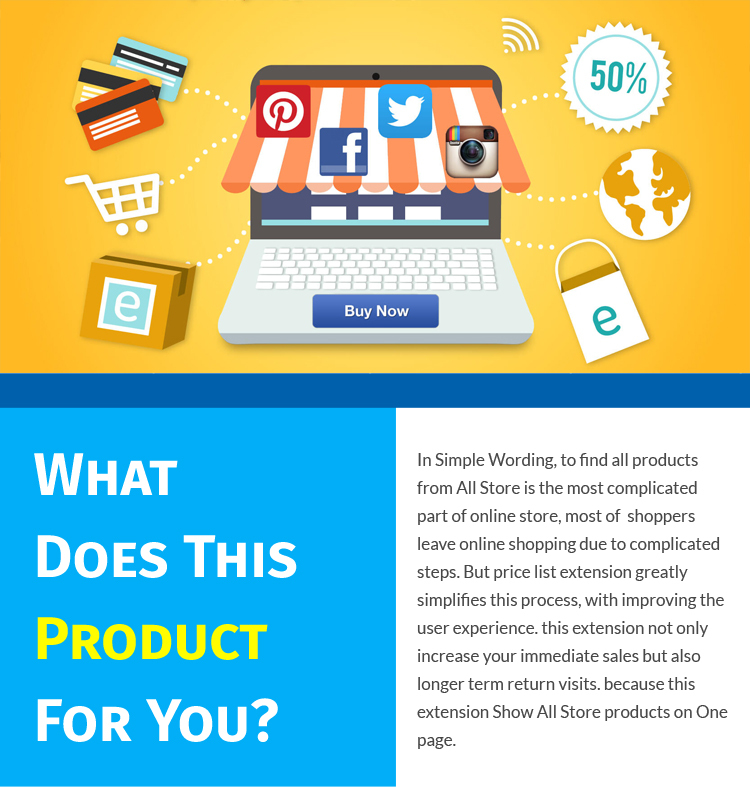 We know how much effort you did for customer traffic into your online store. When you apply Price List module on your store you make it easier for shoppers to see all store products on one page, that is easy for customers they can filter products according to need, that increase your sales conversion. with this customer feel good shopping experience on your store and they will visits again on store. - This extension is very beneficial for the ones if any of product have 0 price in this case admin can set custom code for product price column Like any custom text, link or image. - admin can display product data in bar code from a product SKU. you can Create SEO friendly url for price list link that is easy for access and seo has benefit for your store. Customer can view all Store Products on same page. So now customer has no need to waste his time to find multiple products from all store. 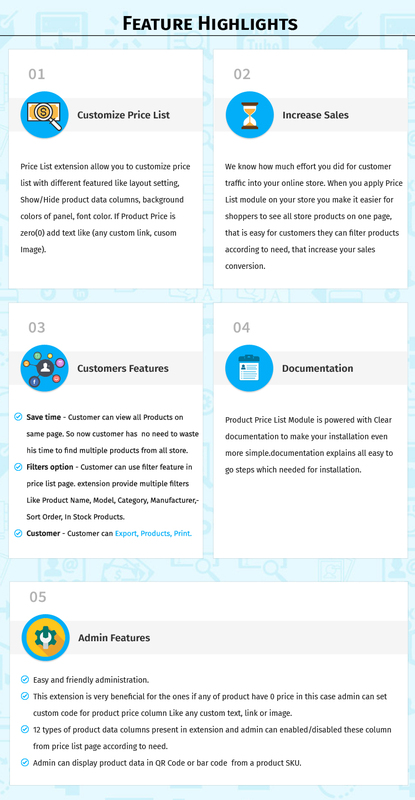 Product Price List Module is powered with Clear documentation to make your installation even more simple.documentation explains all easy to go steps which needed for installation. Price List shoppers see all information on one page, above the fold. The latest technologies have been used to make it quick and easy because all list of product with multiple info is available in one page with all options in clear view. so this simple Process make it user friendly. 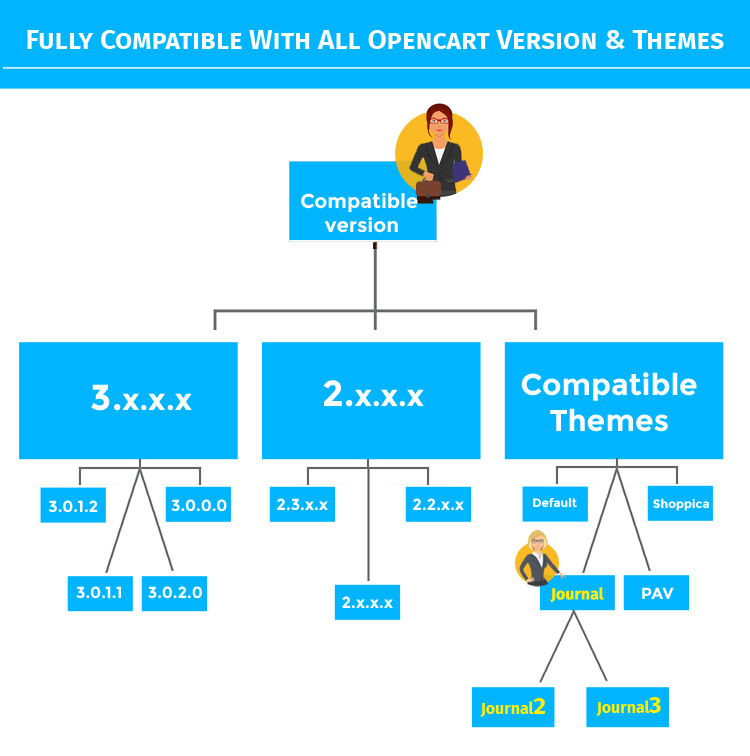 We are on Opencart Market Last 7 Year. In this Markit we make 200+ Module and Many Themes so we have bulk of Knowledge in this framework. if our customer Face Any Issue During Installation Process we Provide Absolutely Free of Cost Support. This Process is 3 Month after your purchase, you can enjoy technical and feature support.